The first diffrecence between two cities to be mentioned is morning routines. 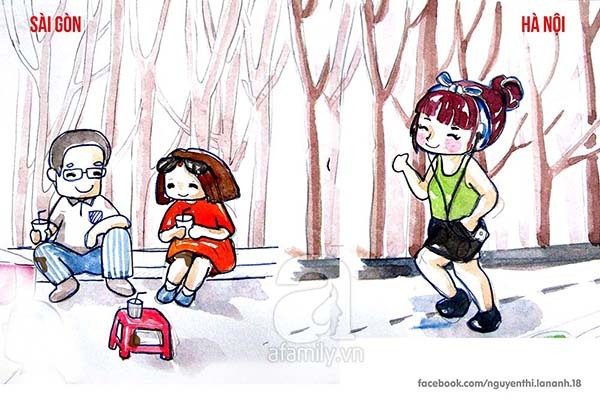 While Saigonees would love to start a new day with a cup of coffee while reading newspaper in a quite corner café, Hanoians enjoy early morning in the parks or by the lakes doing excercises. Speaking of breakfast, to some of Saigonese, coffee is breakfast. They rarely have breakfast, but when they do, it must be served in a good restaurant. Hanoians’ breakfast s far mor diverse and simpler.They can eat anything at any restaurant as long as the food worths their visit. In fact, good breakfast is often served by traditional restaurants set in small lanes or at narrow sidewalks. 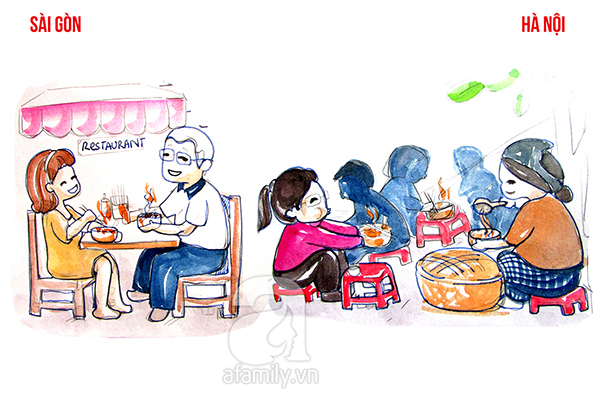 At weekends, Saigonese families often eat outside at restaurant to treat the children with delicious meal. The following destination of the meal is always a theater or cinema. 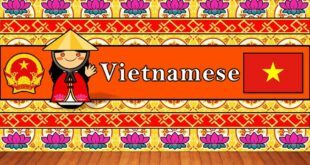 What about in Hanoi where traditional value is well reserved? 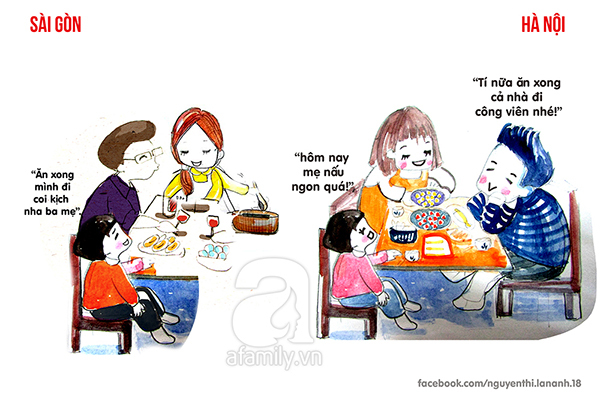 Well, the Hanoian families like having meals at home rather than at restaurant. This is the occasion for parents and children to spend time for one another. Amusement parks and super markets are favorite destinations at weekends. Nobody wants to be an unexpected house guest at meal time. 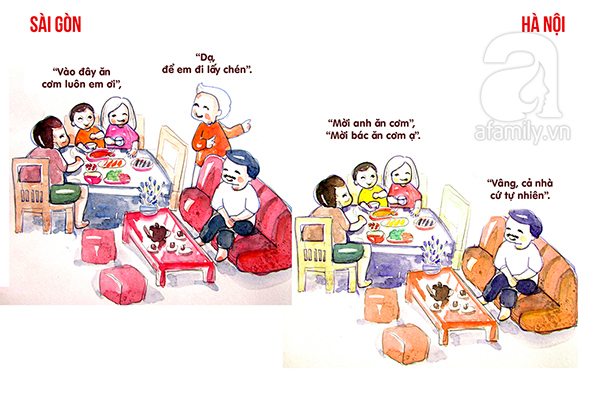 When you happen to visit a friend in his/her meal time, generally, Saigonese will ask you to join for the meal with all of their heart. Hanoians give the same invitation this situation but the offer doesn’t really mean what it means. 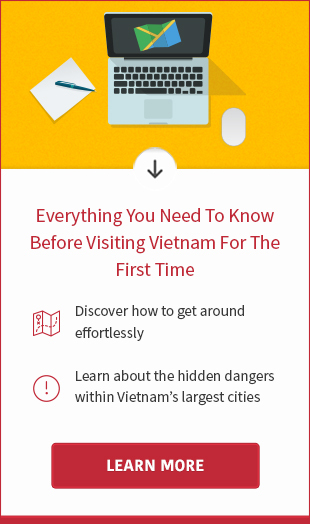 It can be understood as the way to show politeness, therefore, in most cases, the guests will refuse and quickly leave to return privacy to the host. 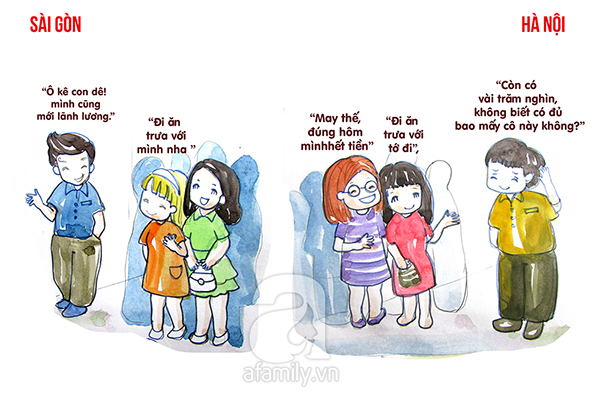 Saigonese people are very straightforward in social relationships. If they propose to eat out without mentioning who pays the meal, it means you will split the bill. 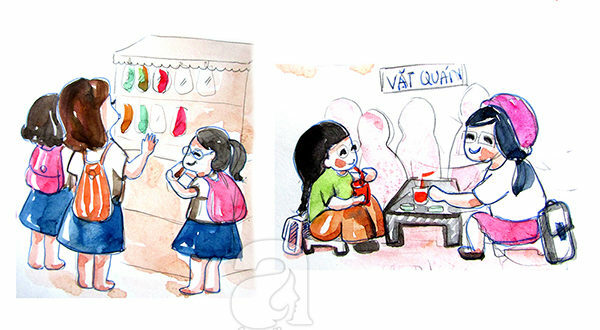 In the same situation but happens in Hanoi, it is understood that either you or the friend will pay for both. In most cases, it should be the friend. Saigoneses usually hang out after work. The popluar place of meetings is restaurants, where they can eat, drink and have a laugh. They will not come home till late evening or even midnight deppending on atmosphere of the party. 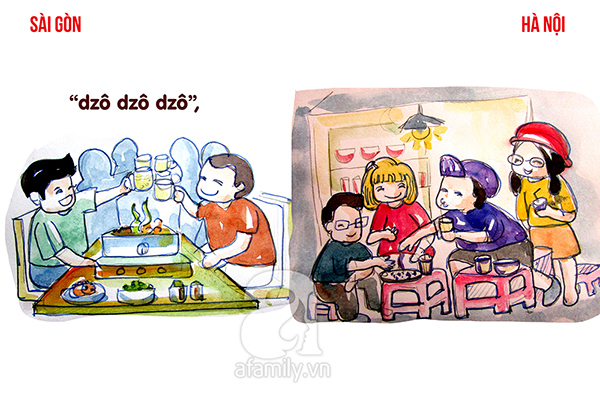 On the contrary, Hanoian people prefer a night out with friends after dinner at café or street tea shop till 10 pm or 11 pm. 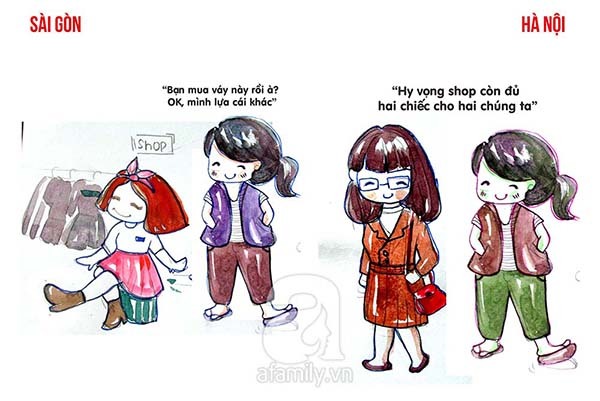 What if two Saigonese girls are interested in the same dress in a shop? The answer is just one of them will buy that dress and the other girl will be happy to take another one. They have strong vibrant personality so it is unaccepttable if they are identical to someone else. Howerver, Hanoian girls do not mind about that. They are willing to buy same dress as long as it is beautiful and suitable to them. 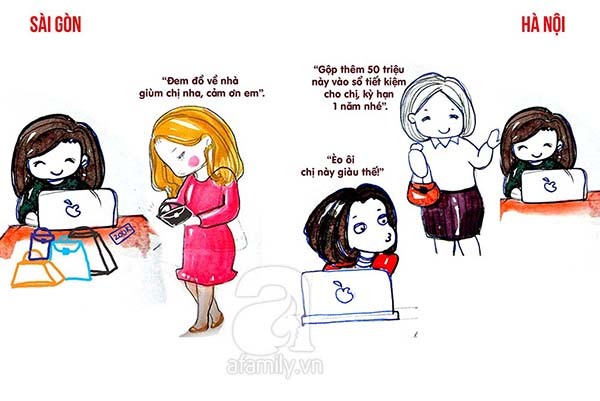 Hanoian and Saigonese has different percetion of wealth. The Hanoians believe money and property you have will say you are rich or not. 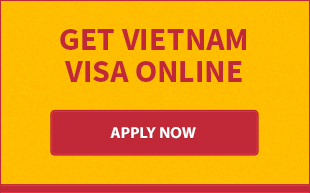 On the other hand, Saigoneses assume the amount of money you spend will determine that. Vehicle selection is partly affected by different perception of wealth in the two cities. To Saigoneses, vehicle is simply a mean of transport. Thus, they don’t waste money on expensive motorbikes. The old motorbikes are seen everywhere in here. 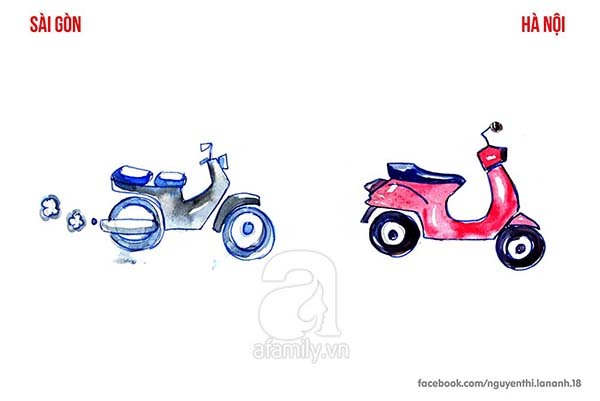 About Hanoians, motorbike is not merely a vehicle. It is regarded as a decorative object to expose your wealth. For this reason, they don’t mind investing a lot of money on it.